An SSD drive is a hard drive that’s made up of memory chips. It works the same way as a traditional hard disk drive. You wouldn’t even know you’re using an SSD if it wasn’t for the difference in speed. Traditional Hard Drives (HDD’s) store their data on spinning metal platters, and to access your data, a little needle-like component (called the “head”) moves to the data’s position and provides it to the computer. Think of an old record player. An SSD drive has no moving parts, and just grabs your data from its memory chips. Much faster! If you’d like to read further about this, here’s a great article at PC Magazine. In case you’re wondering how long they last, unlike their older counterparts, modern SSD Drive last a very long time. In fact, they will become outdated before they die, and you’ll probably have bought a new computer by then. Boot times will be significantly reduced, sometimes at fast as 10 seconds! Launching applications, installing programs and opening files will occur nearly instantly. Added Bonus: They are shock proof, so they won’t break if you drop your laptop. Benefit 2: SSD Drives use less electricity, thus increasing your laptop battery life. SSD Drives use less power. 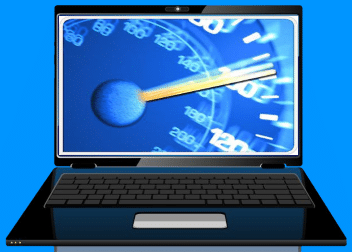 If your laptop or desktop PC is getting slow and you’re feeling it’s time for a new PC, stop and think about it. The main thing that fails and slows down your PC is the hard drive. It’s very likely that the rest of your PC is just fine and may last several more years. If you replace the hard drive with a new SSD, it will be faster than most new PC’s because the new ones still come with regular hard drives, unless you spend around $1,000. That’s right, an upgrade costing as little as $200 can give you the equivalent of a $1,000 PC! Consult with your local Computer Repair shop and have a PC Technician check out your system to see if it’s healthy enough for an upgrade. We recommend letting them install the SSD with the proper configuration settings. Differences in Using a Computer with an SSD Drive. This only applies if you have lots of data. Know that SSD Drives are smaller and have less storage capacity than old mechanical drives (per dollar cost). If you have a desktop PC, you can easily have a 2nd hard drive, a traditional mechanical one, to store your files, especially music, pictures and videos. If you have a laptop, use any of the several Cloud storage services, like Dropbox, Google Drive, Microsoft One-Drive, etc. The main strategy in SSD usage is to use the SSD only for system files and your main applications (MS Office, Quicken, Quick Books, Photoshop, Anti-virus and other major utilities). This will give you all the perks of fast boot times and application launches, but you won’t fill up your drive as fast. A large SSD Drive (over 500GB) is over $200, so there’s no reason to break the bank for a large one. Instead, just buy a small one for your OS files and buy a regular, mechanical drive for your data. If you’re the type of person who likes to run lots of applications at once, or use certain big, slow-loading applications such as Adobe Photoshop, it’s well worth it. If you like to shut down and restart your computer a lot, you’ll like the decreased boot time of an SSD, lessening the time waiting for your computer to start up and increasing the time you spend working. On the other hand, if you tend to just use your computer to check email on the web or write documents, you won’t notice the benefits of an SSD as much. They won’t make your internet any faster, but it will make websites with lots of media, like video or game sites, more responsive. As always, please feel free to contact us with any questions you may have on this, or any other computer or mobile technology issue. You can find our contact information clicking here for Tucson Computer Repair website.